A US judge has ordered a hearing to consider new evidence relating to the 1987 double-murder conviction of a British businessman in Miami. Krishna Maharaj, now 75, spent a decade on death row before his punishment was reduced to two life sentences in 1997. He says Colombian drug traffickers were responsible for the 1986 shootings of Duane and Derrick Moo Young in Miami. The hearing, likely to take place later this year, could lead to a retrial or reduced sentence. At the 11th Judicial Circuit Court of Florida in Miami on Thursday, Judge William Thomas granted the new hearing which will be able to hear from witnesses. In his ruling, Reuters news agency reported, the judge said he was not "opining on the merits of the evidence" presented by the defence or "Maharaj's ability to establish his right to a new trial". Lawyers for Maharaj say there is evidence the killings were carried out "at the behest of Pablo Escobar", former head of the Medellin cartel, who was shot dead by Colombian security forces in 1993. Following the ruling, Maharaj, who previously lived in London, said in a statement: "I am absolutely elated by the judge's decision and I can't wait for the whole truth to come out in court." His wife, Marita, added: "I don't even know how I feel right now. "We have been fighting for 27 years. I know we haven't finished yet, but at least we won a battle." Clive Stafford Smith, director of legal charity Reprieve and a lawyer for Maharaj, said the judge's ruling was "fantastic news". "Judge Thomas has shown great courage in ordering this crucial new hearing, which is a vital step along the road to finally proving Kris's innocence," he said. "At last, after 27 years in prison for a crime he patently did not commit, there is a chance that justice will be done in Kris's case." According to a drug trafficker quoted in the defence motion, the Moo Youngs were "eliminated because they had lost Colombian drug money". Prosecutors objected to reopening the case, saying the defence motion was based on "hearsay and inadmissible evidence". 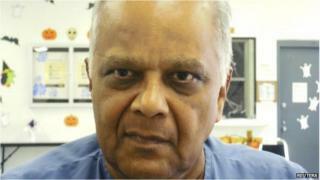 Video Krishna Maharaj: An innocent man jailed for 26 years?